Maffei 2 is the poster child for an infrared galaxy that is almost invisible to optical telescopes. Foreground dust clouds in our Milky Way galaxy block about 99.5 percent of its visible light. But this infrared image from NASAs Spitzer Space Telescope penetrates the dust to reveal the galaxy in all its beauty. The astronomer Paolo Maffei first noted the galaxy as a mysterious smudge on an infrared photographic plate in 1968. Four years later, he identified the strange object to be a galaxy, now named after him. This discovery was made in the infancy of infrared astronomy, and it would take many technological innovations in the following decades to allow astronomers to study obscured objects like this one in detail. Most other galaxies the size of Maffei 2 had been cataloged for over a century. Because this galaxy was hidden behind dust lanes in our own galaxy, it did not become one of the entries in the famous 18th century catalog of bright deep-sky objects compiled by Charles Messier. 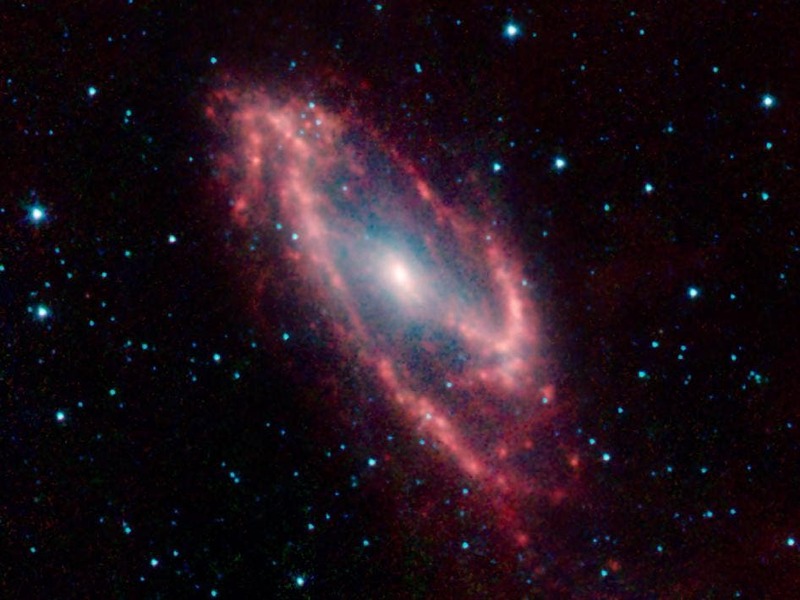 This Spitzer image clearly shows the unusual structure of Maffei 2. The strong central bar and asymmetric spiral arms help identify why the galaxy also harbors a "starburst" in its very core. Such dramatic bursts of star formation occur when massive amounts of dust and gas are driven into the center of a galaxy, often by gravitational interactions that create the barred spiral structures.